Amtrak announced today that it will suspend the four-times-weekly Chicago-Indianapolis Hoosier State effective July 1, unless grassroots passenger advocates in Indiana are successful in overriding their miserly governor’s wishes and getting $3 million added to next fiscal year’s state budget. This would mark the first Amtrak ‘train-off’ in 14 years and the first unintended casualty of Section 209 of the 2008 Passenger Rail Investment & Improvement Act (PRIIA). This absurd outcome, which should not have come to pass in the first place, would demonstrate that this statutory provision is not achieving its stated goal of improving passenger train service and needs to be reworked in next year’s surface transportation reauthorization law. Indianapolis-bound Hoosier State train 850 makes its way out of Chicago, moving onto Norfolk Southern trackage at 74th Street on the city's south side, on March 22, 2017. The train is carrying a Heritage dining car to Amtrak's Beech Grove Shops. Photo by Jonathan Lee on Flickr.com, used with permission. Section 209 requires the states served by an Amtrak route that is 750 miles or less in length (except for route segments that use the Boston-Washington Northeast Corridor spine) to cover the portion of those routes’ operating costs that is not covered by passenger fares and other revenue generated by Amtrak. Each route’s operating costs are determined according to Amtrak’s accounting formulas, which are deeply flawed, but that’s another topic. Before this law’s enactment, most less-than-750-mile routes were already under state auspices, but some — including the Hoosier State — were completely Amtrak-funded, supported in part by federal grants. There have been some improvements to shorter-distance non-NEC services since the enactment of PRIIA, but most of these have been to routes that were already state-supported before PRIIA, like the Cascades, the San Joaquins and the Piedmont corridor. It is likely that each of these improvements would have happened in the absence of PRIIA. All Section 209 did was shift the operating support burden to the states from the federal government, causing advocates to have to pressure their state legislators for more money just to keep existing routes that were threatened with discontinuance, like the New York-Pittsburgh Pennsylvanian, intact. It would be easy to blame the seemingly imminent Hoosier State train-off on a ‘fiscally conservative’ governor and state legislature — never mind that the same officials would almost certainly not bat an eye at spending $3 million on a highway interchange. However, given that there will almost always be some states whose electeds are more willing to invest state funds in passenger trains than others, the federal policy written into Section 209 runs contrary to the goal of an integrated national passenger train network as part of an integrated interstate transportation system. There’s a reason why Interstate and U.S. highways don’t stop at state lines — their construction and maintenance is 80% funded by the federal government, exercising its constitutional duty to promote and regulate interstate commerce. If states are willing to invest in developing corridor services that augment a base level of service on the interstate train network, or in modernizing rail infrastructure to cut travel times and boost reliability on existing routes, or in modern locomotives and railcars, by all means they should be able to. But users of interstate train services should not be disadvantaged by their state government’s refusal to spend even modest amounts to sustain them. Given how skeletal the existing network is, any loss of existing service levels is a significant step in the wrong direction. The obvious and needed solution that would put the Hoosier State out of its misery is to make the Chicago-Indianapolis-New York Cardinal a daily train. The Hoosier only exists to operate on the days the Cardinal doesn’t so that the Chicago-Indy corridor enjoys daily service — but every town and city served by the Cardinal also deserves daily service. Hoosier State train 850, shortly after returning to Amtrak equipment after the Indiana DOT's short-lived contract with Iowa Pacific was terminated, leaves Chicago on March 13, 2017. Photo by Jonathan Lee on Flickr.com, used with permission. Maintaining at least once daily service on all existing Amtrak routes should be a bare-minimum federal responsibility, as they all form part of an interstate travel system. Of course host railroad CSX will ask for a hefty sum in capacity expansion as a condition for hosting a daily Cardinal, but it is the job of the U.S. Department of Transportation and Amtrak to be tough negotiators and come to a mutually workable agreements with CSX and other host railroads. Indiana citizens should call and write their state legislators and governor often to come up with the $3 million to keep the Hoosier State in place for another year. But starting today, all Americans who want a more balanced transportation policy should start calling and writing their U.S. Senators and Representatives urging them to correct the mistakes of the 2008 law and ensure that maintaining a basic interstate passenger train network remains a federal responsibility, with the feds at least providing a 50-50 match for all state investments in maintaining, expanding or improving train service. Disclaimer: Malcolm Kenton is a freelance contributor to Trains and an independent consultant specializing in writing, research and communications with a focus on passenger rail and transit. His clients include Herzog Transit Services, Inc. and the Association of Independent Passenger Rail Operators. 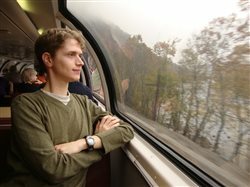 He also works with travel companies to help organize and promote charter train trips in the US, and is an avid and frequent train traveler. The views expressed in Observation Tower are solely his own and do not necessarily reflect the positions or business interests of any of his clients.